Rick Perry calls for more black GOP supporters. Who is responding? Former Texas Gov. Rick Perry called for a stronger connection between the GOP and the African American community in a National Press Club speech last week. Can the Republican presidential candidate win over black voters? Republican presidential candidate and former Texas Gov. Rick Perry speaks at a National Press Club luncheon speech in Washington on July 2, 2015. Presidential candidate Rick Perry is calling for a return of the Republican Party to its Civil War-era roots to "reclaim our heritage as the only party in our country founded on the principle of freedom for African-Americans." In a speech given at a National Press Club luncheon last week, the former Texas governor stated that the key to helping economically disadvantaged African Americans is through implementing conservative policies. If elected in 2016, he said, his plans include increasing employment opportunities, incentivizing work through an expanded version of the Earned Income Tax Credit, and keeping nonviolent drug offenders out of prison. Mr. Perry also apologized for his party's tendency to value states' rights over the equal protection of individuals. “For too long, we Republicans have been content to lose the black vote because we found we didn’t need it to win," Perry said. "But when we gave up trying to win the support of African Americans, we lost our moral legitimacy as the party of Lincoln, as the party of equal opportunity for all." History and statistics suggest that winning back that support will take some doing: Only 6 percent of African American voters supported Republican candidate Mitt Romney, with 93 percent voting for Barack Obama in the 2012 election. 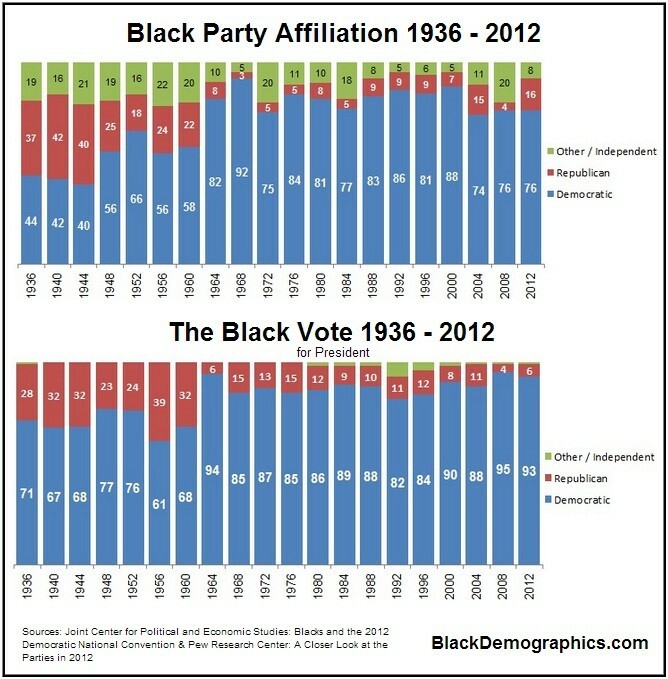 These numbers are consistent with voting patterns over the past 50 years. While some have lauded Perry's speech as a “remarkable” turning point for the Republican Party, Dr. Leah Wright Rigueur, professor of public policy at Harvard University and author of "The Loneliness of the Black Republican: Pragmatic Politics and the Pursuit of Power," says this sudden attention to race has long been standard fare for politicians around election time. "If this is a real sincere effort, what we’re going to have to see beyond rhetoric is real talk about initiatives," Prof. Rigueur says. "This also takes time and progress. We can’t just see Rick Perry coming out and saying, 'Hey, I’m a friend to black voters.' He's also got to have a track record." Rigueur also says that in order to truly win over black voters, Perry will have to expand his focus beyond just job opportunities: he'll also have to address issues like police reform, affirmative action, and housing discrimination. He will also have to distance himself from the Republican Party's "worst element," she says, as people tend to make assumptions about all conservatives based on high-profile far-right commentators. But Dr. Oliver McGee, author of "Jumping the Aisle: How I Became a Black Republican in the Age of Obama," suggests Perry may be on the right track. Dr. McGee served as both US Deputy Assistant Secretary of Transportation and senior policy adviser for the Office of Science and Technology Policy under the Clinton Administration before re-aligning his allegiances with the Republican Party in 2008. He argues that Perry’s emphasis on job opportunities is the key to helping young black Americans living in poverty, pointing to high crime rates in poor inner-city communities as a result of a lack of available employment. He suggests that the far left has focused too much in recent years on civil rights and not enough on economic ones. "Equal opportunity falls within the realm of economic opportunity," McGee states. "This is what the African American community wants." McGee says he's a firm believer that the African-American community is "inherently conservative," but is drawn to liberalism because of "folks who like to discuss race" but who are not necessarily providing solutions. He says many African-Americans consistently vote Democrat due to a "herd mentality" and lack of information, and encourages other people to vote against the majority, as he does. "You step into independence through being a contrarian," McGee says. "This is how revolutions have started."